The genie complete is the ultimate slimming and toing system which incorporates the most powerful Non surgical face lift machine on the market today. This is thanks to 10 minute face lift technology of Medi Wave, built in to an equally powerful body contouring system. Genie Take 10 – As we get older our muscles shrink causing surrounding fat and tissue to take on a drooping appearance. When facial muscles begin to shrink the dropping effect on the face can be very ageing. By rebuilding the ageing muscle mass to its previous state the face is fuller and benefits from a visible lift which can be retained with regular treatments. The fuller look also helps to eliminate many lines/wrinkles and lifts the double chin/jowl area. 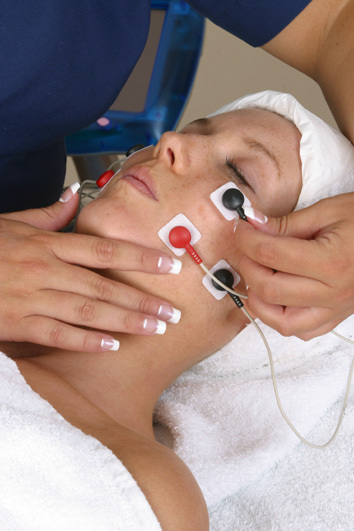 Genie Micro-tech Is designed to work in harmony with the bodies own bio electrical field. Proper firmness can be re-established through the non-surgical procedure by correcting sagging muscle. Which in turn corrects the sag of skin stimulates blood circulation which helps improve muscle tone, counteract dryness and reduce puffiness.